Accurately track incoming and outgoing shipments, logistical information, or inventory with the Winholt OTE-2227E1-GY gray steel enclosed receiving / shop desk! This receiving desk features a welded steel construction with a mesh metal cabinet for heavy duty strength to stand up to the rigors of a busy workplace. Its enclosed structure means that documents won't get shuffled or pushed around by passersby, and the lockable doors ensure that no one except authorized personnel can access crucial records. For added convenience, the see-through mesh allows you to visually inspect the desk's contents, and open-paper compartments on top of the writing surface increase organization. Two undershelves hold all the binders, files, and other records you need to keep your business in perfect order. 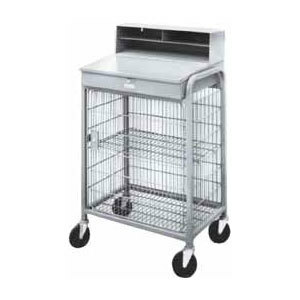 This is a nice mobile table unit for receiving food orders as needed. Easy to keep paperwork organized in the cage below. Nice sturdy table top for inspecting product.